I don’t wait on lines very often. For one thing, I rarely leave my house. For another, I’m too impatient, it always seems like I could be doing something better with my time. I can’t think of all that much worth waiting on line for. I don’t mind waiting, in general, I never get bored; boredom is against my principles. But there’s something about a line of people I just can’t seem to tolerate. Today, however, I found myself on a line in the grocery store and I didn’t really mind. I clutched a box of moldy clementines, and I waited for the attention of the customer service representative. And when it was finally my turn, I had no proof that I’d bought the moldy clementines in this location. For all she knew I could go from store to store with moldy clementines, slowly building up my fortune $7.99 at a time. So she had to venture out into the store to find a price, or someone to help, I’m not sure. But I didn’t mind. I was avoiding something, or some things. I’ve started a new novel, I’ve started a new story, I’ve started a new Ordinary post. I want to write them, I feel like I should write them (why? I don’t know.) I wake up every morning and go to sleep every night determined to write them. But when I sit down to do it I get a heavy fog behind my eyes and I don’t know, maybe my time is better spent waiting on line clutching a box of moldy clementines. Maybe I’ll become one of those people who goes out of their way to complain about things just for a bit of attention or to pass away an afternoon. I’ll send food back at restaurants, even though it’s exactly what I ordered. I’ll call help desks and technical support lines just to chat for a bit. While I was waiting I noticed that the store offered a new feature: a beauty consultant. He was a young man who looked surprisingly elegant, even in his store-issued vest. He had a booth that looked like it could have been made for a high school science fair; a mirror, a stool, a glass jar of cotton balls. A sign said that if we brought in our makeup bag he’d help us make the best use of it. I thought about taking my lipstick out of my coat pocket and saying, “Here’s my makeup bag! Help me out!” And I caught a glimpse of my old face in his mirror in the flattering fluorescent lights of the grocery store and I thought about the women who must end up on his stool in a grocery store in this part of the world–the glamor! I wondered how he’d gotten this job, and I thought maybe he started out as a clerk or a stock boy, but he had this idea and the store let him try it. I hoped he was happy with it, even though he seemed to spend most of his time wondering up and down the aisles. Everyone seemed happy that he was there, everyone seemed to love him. It made me happy to see him there. I thought about how I’ve always said it was a good thing that I had sons because if I had daughters and they asked me how to apply mascara or any other makeup product I’d have to say, “F**k if I know!” But here was someone’s son who obviously knew all about these things. I got my $7.99 and I left the moldy clementines at the desk, and I wondered if they had a whole pile of moldy produce and spoiled milk back there, and maybe they came to life at night as spoiled-food spirits. I apologized for wasting the clerk’s time, and while I drove home I remembered a conversation last week in which somebody had said, “How do you kill a day?” How do you kill a day? It’s too easy, days are very fragile. I apologize for the crappy picture on this post. The pie was good though. 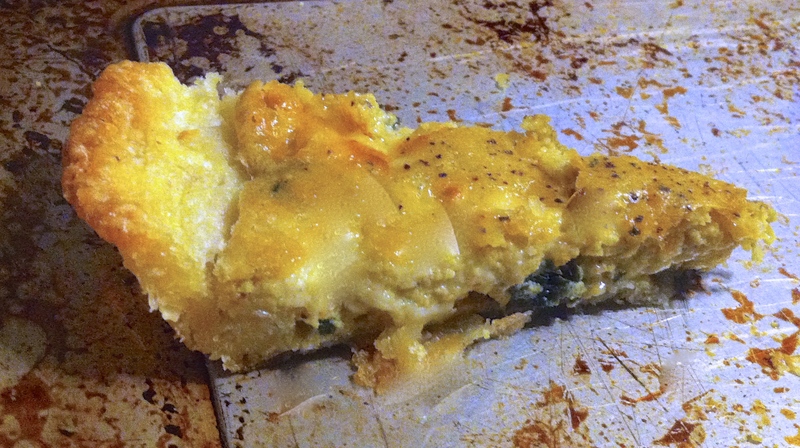 Normal sort of crust, topped with greens and rosemary, then a layer of cheese, then a savory pistachio frangipane. I thought it had nice flavors and textures…comforting for a cold day. And it wasn’t too hard to make. Here’s Everybody Plays the Fool, which is a song I heard at the grocery store, and which I like a lot. Hello again, Ordinary friends! I hope everybody had a peaceful joyful holiday. We did, although my bad cold has turned into something else lingering and painful in my head, which makes me feel like I’m under water. I couldn’t hear or think or smell or taste, and the past few days I’ve had a strange sleepy feeling of not being fully present. I must confess it’s given me the oddest feeling. Sometimes things work in your head but they don’t work in real life. Something you cook or write or draw makes so much sense when you think about it, but upon execution it’s just not quite right. Well, it almost felt that my whole life only worked in my head. My whole world that I’ve created for myself only worked in the isolation of its own little microcosm, everything contained in fragile little bubbles, and upon exposure to reality they *pop* and everything floats away, as insubstantial as you’d always feared it might be. I met a stranger and she asked what I did–she said, “What do you do?” And I panicked! I giggled and yelled “crossword puzzles!” Naw, I didn’t, but I think I might have babbled about how pretty my dog is. Not that it matters, but it’s a big question and I wasn’t ready for it. However, however, this morning Clio and I went for a long walk on the tow path, and it felt good to get back because it’s been so slick and icy it wasn’t walkable. And it’s remarkable how much color there is this time of year, if you really look for it. In the bark of the trees, and the lingering leaves, and the vines and the rocks and the moss and the pale golden green wintery light. In the pretty busy cedar waxwings and robins and cardinals. And we came to a place at the end of the path, where a golden field curved softly before us, all covered in frost, and an arch of pale cobbled clouds curved softly above us, glowing with morning light, and I swear, standing there between them you felt you could breathe it all in, you could inhale this hopeful light. Well, my spirits were elevated, my head cleared and I thought about rebuilding the world in my head. Which is after all a very strong and vivid world, most of the time, built on my very strong love for the boys and David and Clio and the towpath and this town and my new five blank notebooks and my new sea green pen with a small white whale on it and all of the stories I’ll write with it, which are in my head already, waiting to come out. And then I came home and coughed a lot, but minutes later I could actually smell Isaac’s new modeling clay, and I could feel things coming into focus. And this is what I did on my winter vacation. 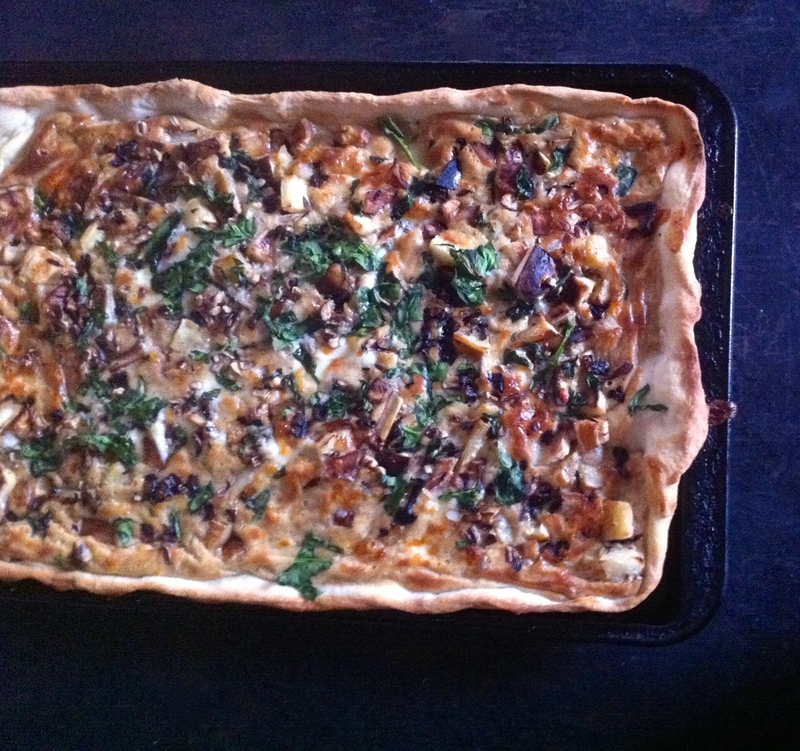 Plus I made this parsnip pie. It has a filling of almonds, hazelnuts and eggs, seasoned with rosemary, nutmeg and lemon zest and mixed with roasted parsnips and bright kale. I think it probably tasted good. And that’s all I can say about that because I’m late for work! Here’s Nina Simone with In the Morning, which has been stuck in my head for days. Here at The Ordinary’s institute of culinary studies, we have an entire division devoted to the study of nut custards. It is completely staffed by squirrels, who are frantically busy this time of year. They are, in fact, so occupied with eating and burying the test subjects that they have not had an opportunity to report their findings. So many questions still remain. Viz: If a sweet baked almond custard is called frangipane, does that same word apply to a savory almond custard? How about a sweet hazelnut, pecan or walnut custard? How about a savory pecan, hazelnut or walnut custard? I know that I’ve discussed these issues before, and I’m in danger of becoming some sort of nut-custard fanatic, wandering the streets of town mumbling about nuts, but I need answers, dammit! It’s keeping me up nights! Not really, but I would like a better way to describe it. 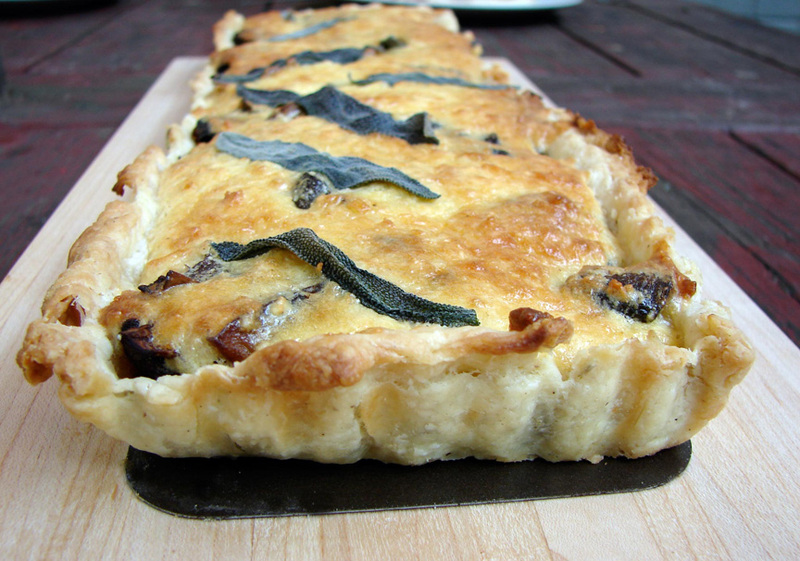 I’ve been experimenting lately with various types of nut custard in savory tart applications. For instance, we had a greens and pecan tart the other week. Some time back we had small chard and almond tarts. 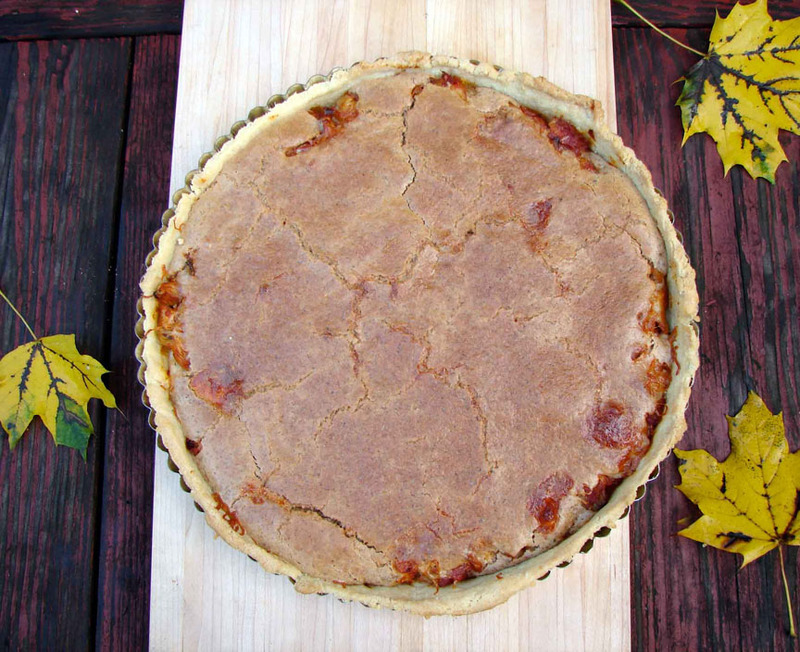 This being autumn, I decided to try one with walnuts. I made a sort of smoky, spicy, sharp sofrito of tomatoes and artichokes, and I added lemon zest to the walnut custard, to add a little brightness to the sweet earthiness of the nuts. A walnut custard is nice, soft underneath, slightly crispy on top. We need to come up with a new name for these new nut concoctions! 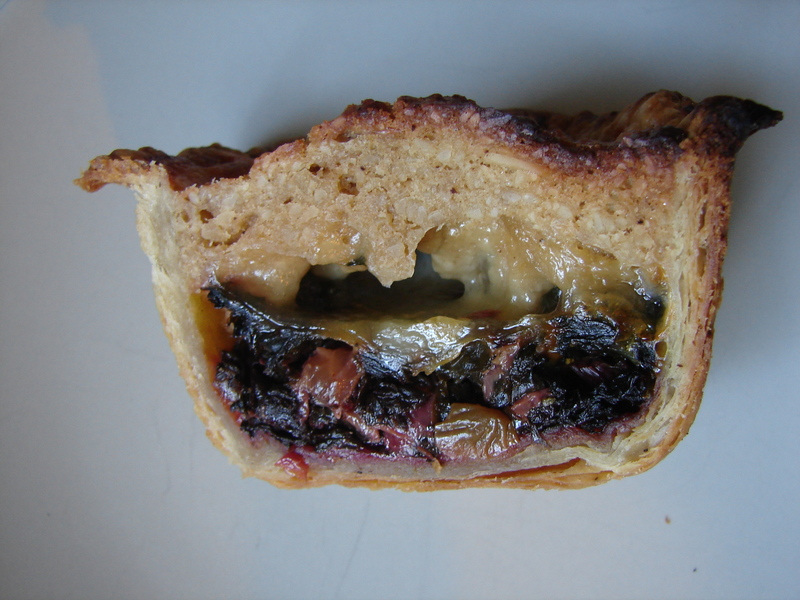 We’ve created a committee, and we’d like report their findings, and to tell you the general consensus about the deliciousness of this tart, but the squirrels have taken all of their pieces to the tops of the trees, and won’t come back down to file their reports. Here are the Squirrel Nut Zippers channelling Cab Calloway in The Ghost of Stephen Foster. Last night was something of a momentous occasion here at the test kitchens of The Ordinary. If you’re following along at home, you may remember that I recently made some forays into the experimental realm of savory almond custard. I lay awake thinking “if it doesn’t have sugar in it, can you still call it frangipane?” (I wish this was a joke!) And my first effort, though tasty, didn’t really let the savory almond custard shine. Well…last night I made these little tartlets. They have chard and raisins (big eye-roll – again, Claire? Oh, yes.) they have rosemary, they have garlic. They have mozzarella (secret melty cheese!!). And they have this almond custard – ground almonds, butter, eggs, a smicker of balsamic, a smicker of white wine. It turned out so nice! 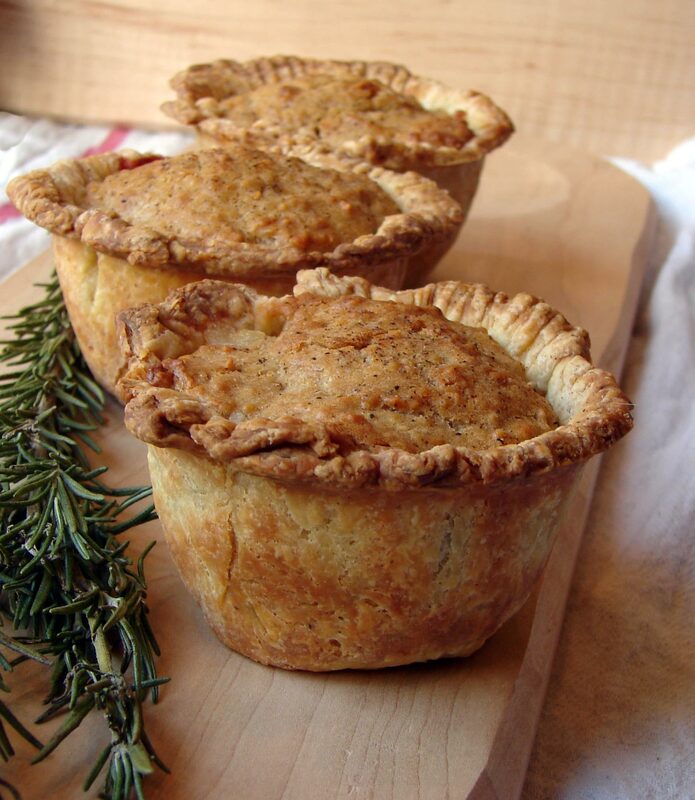 Crispy on top, soft in the middle, and very delicious! I’m sorry to sound so pleased with myself, but I am quite proud, because I really didn’t know how it would turn out. It could have been a completely disaster. I hate when dinner is a complete disaster. You could bake this as one large tart, if you preferred. And you could really use any kind of cheese you like (or not cheese at all) I thought about using gruyere or goat or cheddar. But I wanted something mild and salty to balance the sweet strong flavors, and mozzarella filled the bill. Savory almond custard? That’s right! Savory almond custard. Every once in a while I’ll start to muse about why some things are sweet, and other things are savory. Usually at 3 am. Vanilla, for instance. Why always sweet? Why? The other day, as I was making a bakewell tart, I started thinking about frangipane, or almond custard. I love almonds in savory situations, be they ground or slivered or chopped. So why not in a sort of custard? 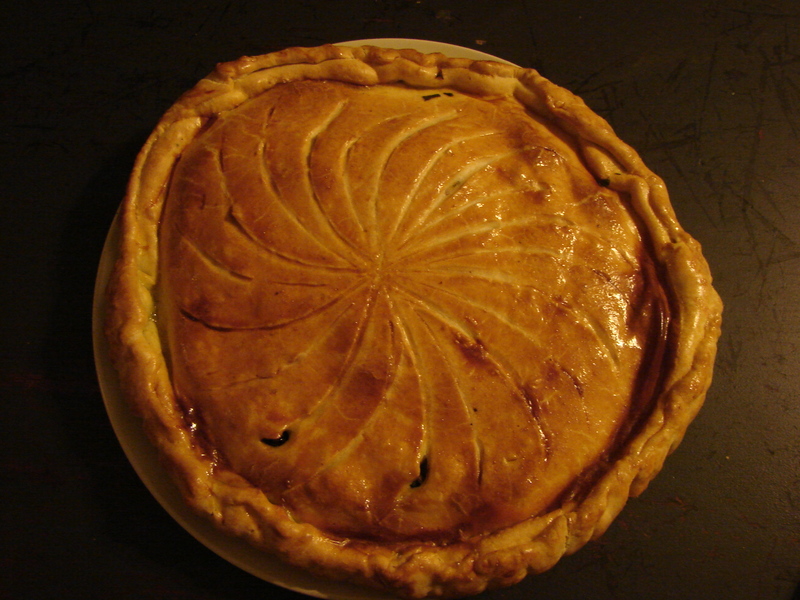 And then came the day I started watching youTube videos of french pastry chefs creating Galettes des Rois – a tart made with puff pastry and sweet frangipane. I got a bee in my bonnet to try to make a savory version. And so I did. 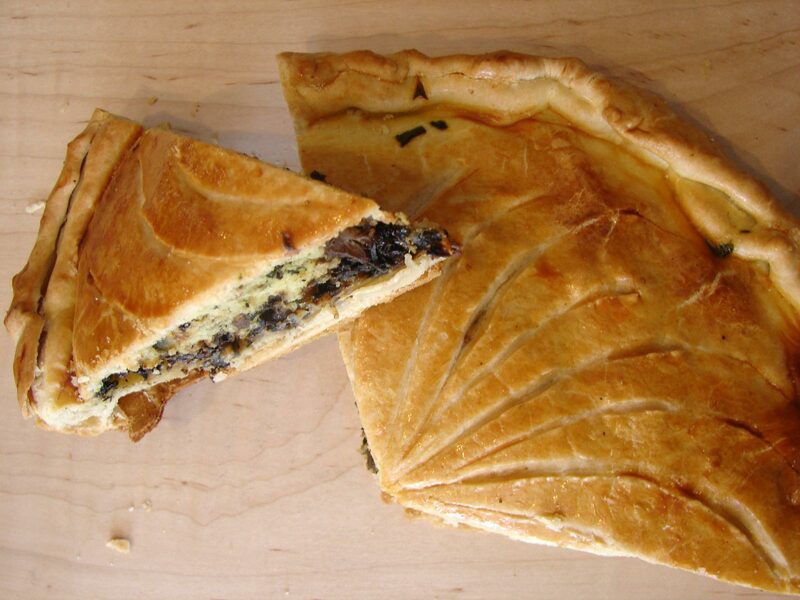 I added chard and mushrooms (porcini & white), because they’re nice with almonds, and I like them together, and I like them in pies! 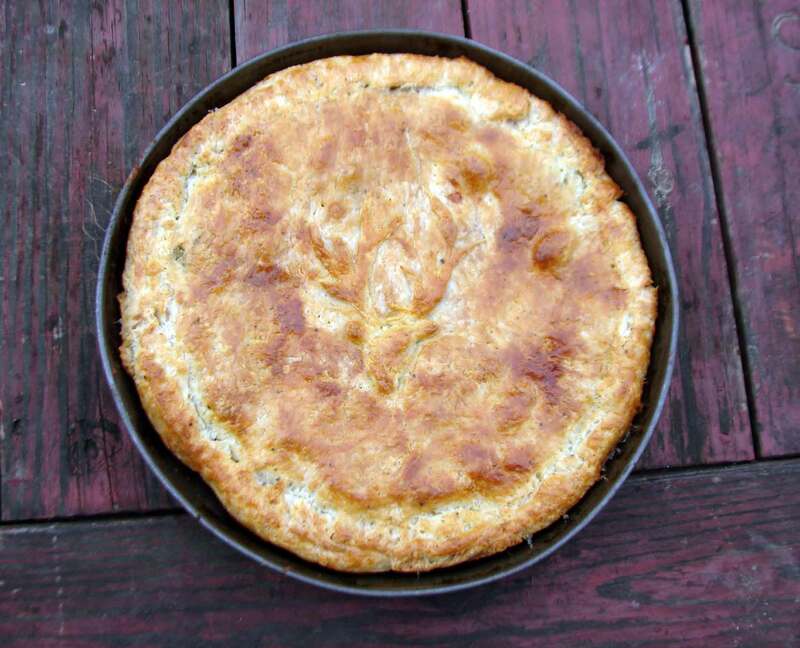 The pie was delicious with chard and mushrooms, but it overshadowed the almond custard a little bit, so I fully intend to someday make a version with only the almond custard. Oh, and I added cheese, too, because I like cheese! I was full of indecision on this score. I could imagine any number of varieties of cheese tasting good here. In the end I decided on smoked gouda, because as I walked the boys home from school the smoke from fireplaces all over town incited a craving. I used the soaking water from the porcini mushrooms to make a sauce. I combined it with port wine, shallots, herbs, and a tiny bit of cream.